Welcome to Hot Mess, the place to come for the old school sh!t, the tracks that make you move..that make you feel that groove! Running bi-monthly at Brown Alley and showcasing the finest of Melbourne's underground sound we'll be taking you on a journey through disco, house and techno and making you jack that big booty all night long..
Cupids Cut - Cupids Cut has been entertaining Melbourne's crowds for the last 7 years hosting a number of parties including Vinyl Vixens - 4 to the Floor and Super Nature. When she's not promoting a party, it's likely she's behind the decks either stimulating the scene with some sleek sounds or it could be she's igniting the dance-floor and keeping the party on its toes until it’s irrefutable end. With past residences at The Workshop, The Fox Hotel, The Workers Club, Purple Emerald and Loop Artspace and bar. Expect to hear a wide range of classic house, disco, funk and boogie for a intoxicating vibe that fans the late night flame. In the immortal words of Prince 'Life is just a party'. 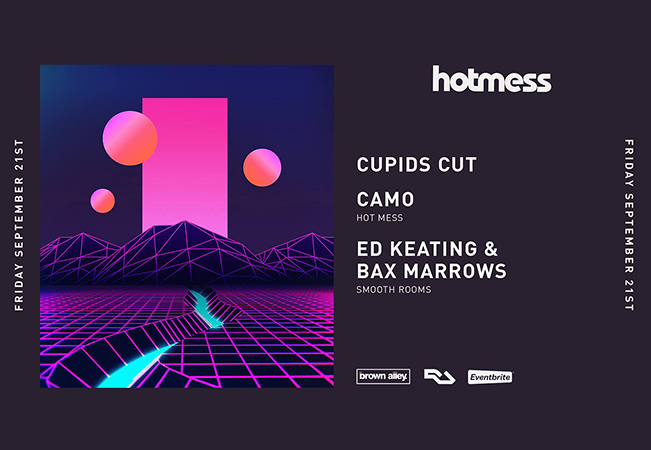 Camo - Hailing from Manchester and having worked on parties such as The Warehouse Project and Parklife Festival he is bringing his old school Chicago and Detroit vibe to the sound systems of Melbourne. You can always expect a wide variety of music in his sets from disco through to techno with a funky kind a flavour running throughout! Ed Keating & Bax Marrows - The guys behind Melbournes favourite Sunday Sesh "Smooth Rooms" at Dr Moorse. These boys know their stuff and love to dig deep for those special records no one has heard before. They are regulars across Melbourne and have been playing together for years and certainly know how to get a party started!